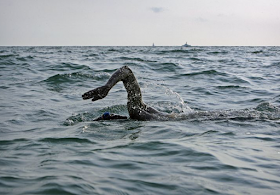 Swimming World Magazine, CBC News and several other media outlets reported that American Adam Ellenstein established a Guinness World Record for the fastest non-stop lengthwise open water swim of a Canadian lake with his VictorySwim105 this week. 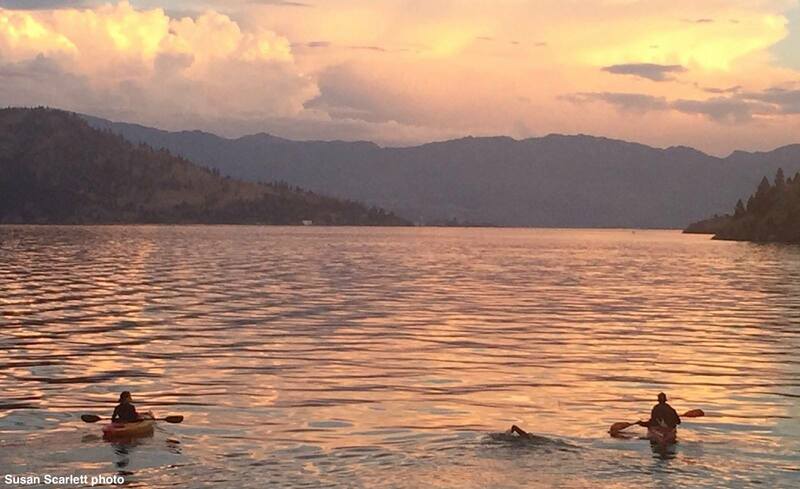 The 39-year-old triathlete from Detroit, Michigan, completed a 105 km (65-mile) swim in 40 hours 47 minutes across Okanagan Lake in Penticton, Canada. "The swim exceeded my expectations and it is all because of my crew," Ellenstein said. "My job was to swim and eat – the crew did everything else. During the most challenging moments, my admiration for my aunt, Susan Scarlett, and her commitment to live well with Parkinson's disease, was the motivation to continue. Each stroke was a demonstration of my love and support of Susan." Ellenstein came up with the idea of VictorySwim105 as a charity swim in order to raise awareness and support to benefit those with Parkinson’s disease through a partnership with the Davis Phinney Foundation. Though weather conditions were nearly ideal throughout his 40+ hour swim, Ellenstein battled colder-than-anticipated water temperature and growing fatigue in his left shoulder. "We had estimated that Adam would take approximately 60,000 strokes during the swim," said Adam's wife and crew chief Amelia Ellenstein. "His left shoulder, in particular, suffered from extreme use, causing him significant pain. 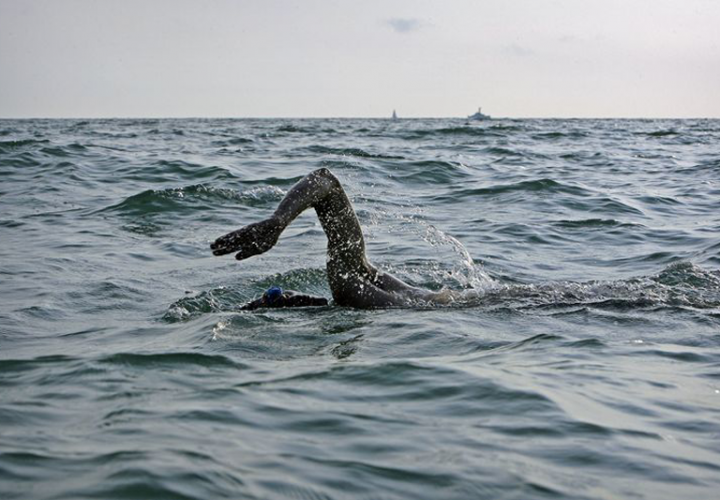 To manage this pain, he swam with one arm for the last 13 hours of the swim." While a world record was claimed and reporters writing articles about the confirmation of the world record, Ellenstein swam in a wetsuit and what appeared to be a neoprene cap. "Swims in a wetsuit provide a significant advantage over non-wetsuit or bioprene swims," described Steven Munatones of the World Open Water Swimming Association. "Adam did a great job completing the swim and raising money and awareness for the David Phinney Foundation, but swimming with a wetsuit and neoprene cap cannot be compared to other great marathon swims in history in my opinion." To keep him warm in water that ranged from 16-21°C (62-70°F), Ellenstein's crew poured hot water into his wetsuit. 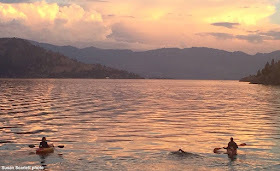 "Openwaterpedia does keep track of many of the longest swims in open water swimming history in our 24-hour Club (see here)," said Munatones. "But wetsuit swims are in a completely different category than non-wetsuit swims and cannot - and should not - be compared. A wetsuit creates both warmth and buoyancy that are not possible in a bioprene solo swim. This opinion is shared by everyone and anyone who has swum in 62°F water with and without a wetsuit. Speed is directly and positively impacted with a wetsuit and neoprene cap because of the additional and significant buoyancy - especially in a freshwater lake - and the additional feeling of warmth - especially overnight or in a swim over 24 hours. Cold is the greatest risk that open water swimmers face. A wetsuit completely minimizes this obstacle." While the media focused on the alleged record, Ellenstein's efforts were focused on raising money for a cause. Ellenstein announced, "Scarlett, who swam for a time with [me] on Monday, said the Davis Phinney Foundation's two defining themes resonated with her and [me]. Phinney, the winningest professional cyclist in U.S. history, was diagnosed with Parkinson's in 2000 and created the Foundation as a way to promote and fund innovative programs, resources and research that demonstrate the effects and importance of exercise, speech and other elements that are critical to quality of life." Scarlett explained, "They are ‘Live Well Today’ and ‘Every Victory Counts.' When you have Parkinson’s, simple activities that one takes for granted, like putting on socks or picking up a cup of coffee, can be real challenges. The Foundation encourages those of us with Parkinson’s to recognize our daily 'Moments of Victory' and celebrate all that we can accomplish." Leading up to VictorySwim105, Ellenstein and the Davis Phinney Foundation encouraged people around the world to get involved by completing a swim of their own at a local pool or other body of water or by making a donation here. Upper photo was posted by Swimming World Magazine. Lower photo was posted by Adam Ellenstein's team.